A couple weeks before Christmas, Eddie and I had a shopping/lunch date. He had been asking about choosing gifts for his daddy and brother, and had really wanted to get lunch in a restaurant, so I suggested a mommy/son outing. He was thrilled about the idea. I have to admit, I was a little excited to get out of the house with a little buddy by my side to, yet I tried to be realistic about how much we could accomplish before he got sick of it all. We decided to do our shopping first. We decided to look for something for Cort first, so I asked Eddie what he thought his daddy would like. That is when Eddie started talking and never really stopped. He had no idea what to get for Cortney. He held everything in the Men’s department at Target. Hats and jammie pants and t-shirts and Christmas undies and superhero undies–complete with a cape. He just couldn’t decide. And we went on like that for a bit until Eddie saw a brown shirt with a bear on it, decided it was hilarious (it wasn’t), and that daddy needed it. So that was it. 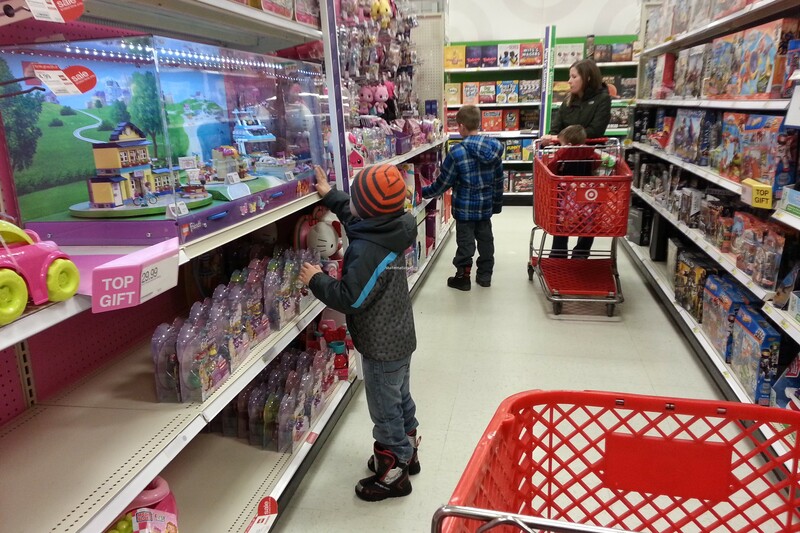 Until we moved on to picking something out for his brother. Oh my goodness. He looked at every. single. item in the toy section of Target. It was so hard to think about his brother when there was just so much he wanted. Eventually Eddie found a Vtech airport that was about $10 over our spending limit. He wanted Bird to have it so badly that he grabbed my hand and said, “but mommy, I have so many tracks and cars and Birdy has NONE. Can we PLEASE get this for him? He will LOVE it!” Then he kissed my hand. Call me a softy, but into the cart it went. 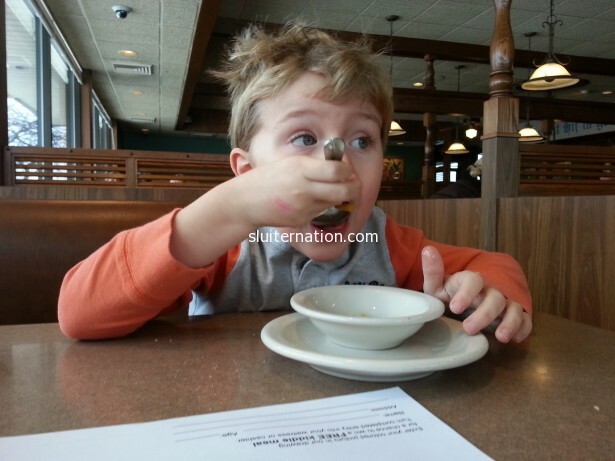 We went to Russ’, a local favorite that is very diner-ish. This was the first time Eddie and I had ever gone to lunch just the two of us. Up until then, he always had someone sitting next to him in a booth; this time he had the whole side to himself and he LOVED it. Our booth was right next to the window so we could see the swirling snow and the rushing traffic. Eddie had a comment for everything and discussed coloring and school and superheroes all while deciding what to have for lunch. 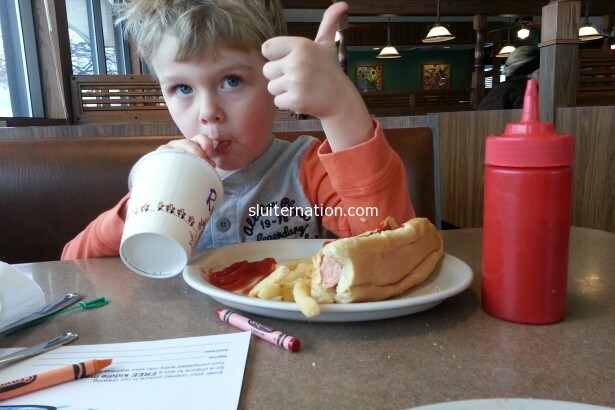 He eventually chose the hot dog with fries and a peach and ordered it all by himself. With his crazy hat hair and ketchupy smile, he told me about school and friends and his teachers and playing at daycare. He told me about his favorite things and what scares him when it’s dark in his room. He asked me for the millionth time about heaven and gave me his philosophy on how our family needs a baby sister. 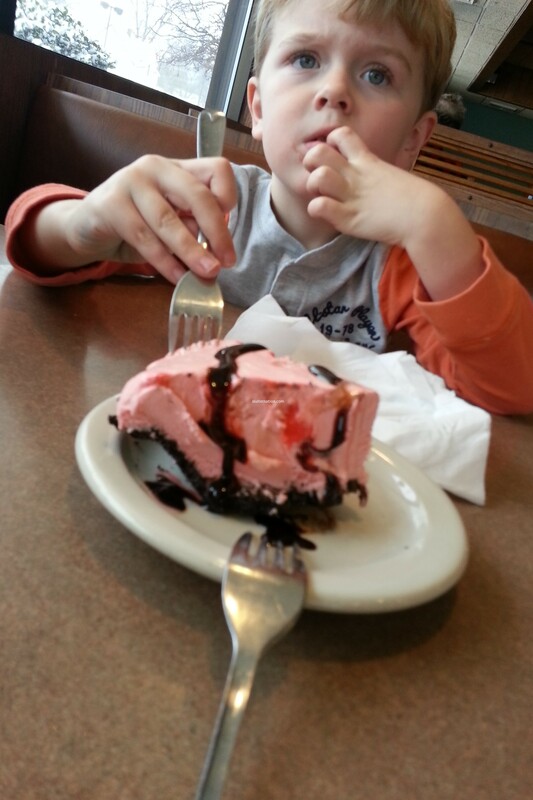 And we even ordered dessert–peppermint pie–because that is what you do when you are out with mommy by yourself for lunch. The waitress was impressed with his manners and his friendliness. I was impressed with how much he has grown up. He’s four and a half. I blinked at how quickly four and a half years flew by and left this opinionated, chatty boy across a booth table from me. Where once there was a colicky baby, there was now a goofy little boy. There was a time when I refused to leave the house alone with Eddie. I just couldn’t do it. I was too afraid…too anxious…too weak. I resented him and his colic and his refusal to nap and just be a “good baby”. That seems like a lifetime ago. But it was just four and a half years. Everyone was right…it didn’t last. Sometimes I miss it. Not the colic. Not the anxiety about the colic. Not the depression. But all that time. All that time when I could have made different choices, responded differently. I can’t help but smile when I am with him. He makes my world so happy. I think we have a new tradition.